Biceps tendon rupture at the elbow is a relatively common injury and is usually fairly obvious, with a lot of swelling and bruising in the front of the elbow. Biceps tendon ruptures are treated by Dr. Peter G. Fitzgibbons, MD at The Centers for Advanced Orthopaedics: Maryland Orthopedic Specialists Division. Dr. Fitzgibbons performed fellowship-training in hand, wrist, and elbow surgery through the Harvard Hand & Upper Extremity Fellowship based at Brigham & Women’s Hospital in Boston. 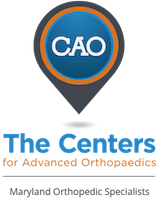 With locations in both Germantown and Bethesda, Maryland, he and a team of orthopaedists, hand therapists, and physical therapists offer a comprehensive range of services covering the diagnosis and treatment of biceps tendon ruptures. What exactly is a biceps tendon rupture? The biceps muscle is in the front of the upper arm, and has two attachments: one at the shoulder and another at the elbow. The muscle’s attachment at the elbow is more likely to rupture from high energy athletic activity, usually in muscular middle-aged men. What is the treatment for a biceps tendon rupture? Surprisingly, the arm usually still functions well after a biceps tendon rupture. In the long run, elbow flexion strength is usually not affected, although supination strength, (i.e. the strength in rotating the forearm to a palm-up position) diminishes by about 50%. If neither that loss of strength nor the cosmetic deformity are bothersome, then patients may not need surgery. Often, due to the deformity and loss of strength, surgical repair is chosen. What is surgery for a biceps tendon rupture like? Biceps tendon repair is performed as an outpatient procedure (i.e. patients do not spend a night in the hospital) and is usually done with general anesthesia (patients are completely asleep). During the surgery, the end of the tendon is sewn back into the bone and anchored there with a small device. Often the repair is solid enough for the elbow to start moving immediately. Dr. Fitzgibbons performs most of these procedures at the Massachusetts Avenue Surgery Center, an outpatient surgery center that provides a safe, patient-oriented experience in a friendly and comfortable environment.